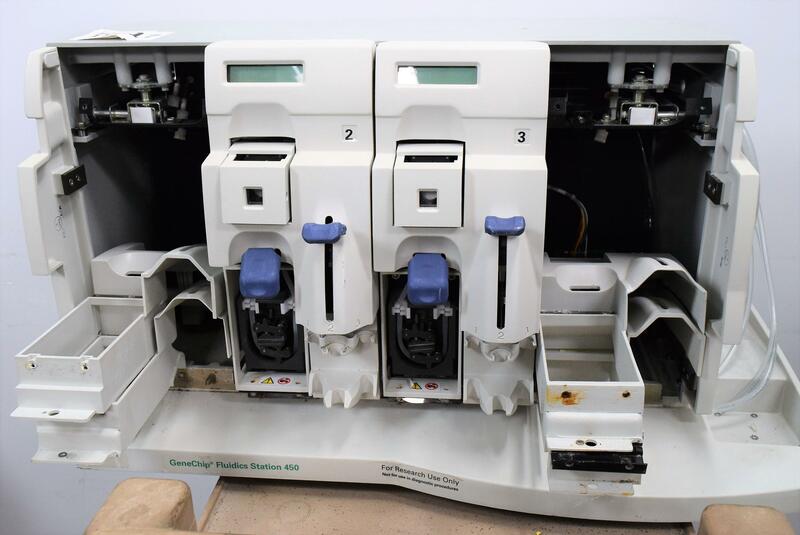 Affymetrix Genechip Fluidics Station 400/450 FS1110 BONEYARD . New Life Scientific, Inc.
No bottles are included with these instruments. If you would like a particular serial number when you order, please message us stating which serial number you would like. Very little cosmetic wear, in good working condition. Internally, these instruments are in excellent, clean condition. Often corrosion can build up in the fluidics station causing issues, but these are quite clean. The GeneChip® Fluidics Station 450 contains four modules. Each module can hold one GeneChip® probe array cartridge and up to three 1.5 mL vials. The Affymetrix® GeneChip® Command Console (AGCC) software on the computer workstation, which is connected to the instrument, can control each of the four modules independently of the others. A single computer workstation can control as many as eight fluidics stations. You can use any or all of the modules at the same time. You can also choose a different protocol for each module as long as each uses the same Wash A and Wash B reagents. The modules are numbered 1 through 4 near the LCD window.